Asbestos labels play an important role in the safety management of asbestos waste. Asbestos is a very dangerous, carcinogenic material and, in the UK, all waste containing more than 0.1% asbestos is considered to be ‘hazardous waste’. Some asbestos products may be covered by ADR Special Provision 168, under CDG. If the asbestos waste is bound in a plastic or cement binder so that the harmful fibres aren’t released during transport (ADR 3.3.1), then the waste is not classified as dangerous for transport, although the hazardous and special waste regulations still apply. All other asbestos waste, such as insulation materials and boards, is known as fibrous (or unbounded) and is classified as dangerous for carriage. These have to be properly packaged and labelled and will require a UN Class 9 hazard diamond. Asbestos waste and raw asbestos must be labelled with the ‘Asbestos warning label’. This must be firmly stuck (or directly printed) onto the outer packaging. Asbestos labelling should conform to the Health & Safety (Safety Signs and Signals) Regulations 1996. The dimensions in millimetres of the label referred to in paragraph 1(1) shall be those shown on the diagram in that paragraph, except that larger measurements may be used, but in that case the dimension indicated as ‘h’ on the diagram shall be 40% of the dimension indicated as ‘H’. Where the label is printed directly onto a product, a single colour contrasting with the background colour may be used. The label shall be clearly and indelibly printed so that the words in the lower half of the label can be easily read, and those words shall be printed in black or white. direct printing onto the product or its packaging, as the case may be. 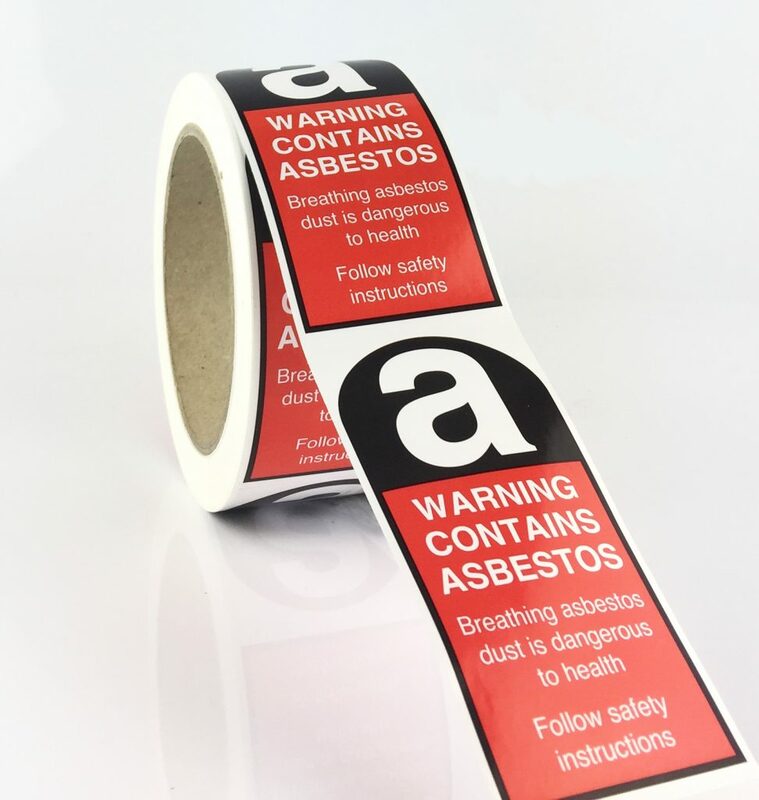 Our self-adhesive asbestos labels provide a visual warning on areas where an Asbestos Tag cannot be attached.